脉管系包括心血管系和淋巴系，是一套分布于全身各处的封闭管道。 Vasculature including cardiovascular system and lymphatic system is a set of distributed throughout the body in closed conduits. 心血管系由心和血管组成，血管又包括动脉、静脉和毛细血管。 From the heart and cardiovascular system of blood vessels, and blood vessels including arteries, veins and capillaries. 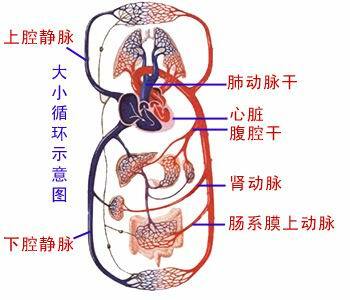 心是推动血流的动力器官，分为四个腔。 Heart is the driving force to promote organ blood flow, is divided into four chambers. 即左、右心房，左、右心室。 That is the right and left atrium, left and right ventricle. 动脉是将血液带出心脏的血管。 Arterial blood out of the heart is of the blood vessel. 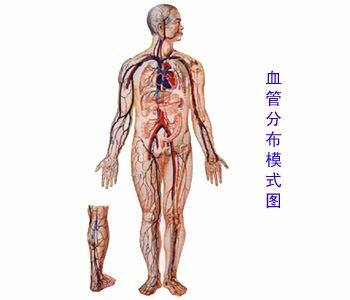 静脉是将血液带回心脏的血管。 Vein blood vessels back to the heart. 毛细血管是连于动脉与静脉之间管径极细、管壁极薄的血管。 Even capillary diameter is fine, thin wall between the artery and vein blood vessels. 血液由心室出发，经动脉、毛细血管、静脉返回心房的周而复始的过程，称血液循环。 Blood from the ventricle, via arteries, capillaries, veins return atrial cycle process called blood circulation. 又分为体循环和肺循环。 Divided into systemic circulation and pulmonary circulation. 左心室→主动脉→各级动脉分支→全身毛细血管→静脉→各级静脉属支→上、下腔静脉→右心房。 Ventricle aorta → → → systemic capillary levels of artery vein → → → vein branch levels, the inferior vena cava → right atrium. 右心室→肺动脉→肺动脉各级分支→肺泡周围毛细血管网→肺静脉属支→肺静脉→左心房。 Right ventricle with pulmonary branch → → → pulmonary alveolar capillary network at all levels around the pulmonary vein branch → → → pulmonary vein of the left atrium.